Examples of structures include single and multi-storey buildings, towers and bridges. The detailing shown will be suitable in principle for fabrication and erection in many countries, and the sizes shown will act as a guide to preliminary design. 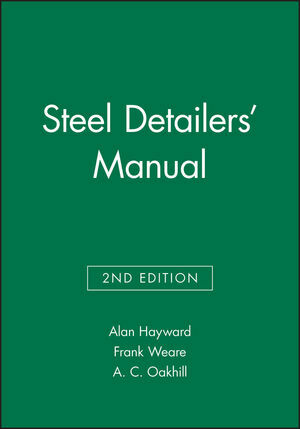 The second edition has been updated to take account of changes to standards, including the revisions to BS5950 and includes a new chapter on computer aided detailing. Alan Hayward was a British engineer and physicist who was also active as an old-earth Creationist writer, and Christadelphian. Hayward's primary field of research was fluid density and flowmeters, writing a textbook on the subject, and presenting to the Institute of Physics in 1981. Frank Weare MSc, DIC, DMA, CEng, FIStructE, MICE, MIHT, MBIM, formerly at the University of Westminster, is currently an independent consultant to various civil and structural engineering projects. Anthony Oakhill CEng, MICE has over 35 years' experience in the design and construction of steel bridges and structures. He currently works for Gifford and Partners', consulting engineers, Southampton. Use of structural steel; Detailing practice; Design guidance; Detailing data; Typical connection details; Examples of structures.